Got a Few Million Sitting Around? Southways, the 13-acre former Pillsbury estate located on Lake Minnetonka's Smiths Bay, is being offered for sale in an auction. The 40,000-square-foot mansion stalled while listed on the market at $53.5 million. The home includes a pool and tennis complex, smoking house, tea house, caretaker's cottage/greenhouse and caretaker's maintenance shop. It is available in its entirety or as five separate parcels of two-plus acres. The 1918 property was originally owned by John S. and Eleanor Pillsbury, son and daughter-in-law of the co-founder of the grain producer and food-making giant. Eleanor Pillsbury died in 1991 at age 104, at which time James Jundt and his wife, Joann bought Southways. Got the cash laying around? The sealed-bid deadline is December 9. The 100 Best (and Worst) Places to Raise a Family by Children's Health magazine ranks 100 American cities according to their family-friendliness. St. Paul came in at 12th and Minneapolis was 18th. Detroit was dead last. The magazine's editors developed the ranking formula assessing 29 quality-of-life variables including household income, unemployment, air quality, infant mortality, home prices and even the number of fast-food restaurants per capita. Residents of the Twin Cities of course know that Saint Paul and Minneapolis are great places to live. Residents of other local communities and regular readers of this blog would also know that more Minnesota towns have appeared in similar lists this year. In July, Sperling's Best Places and McDonald's Happy Meals ranked Minneapolis as the happiest, family-friendliest city in America. Also in July, Money Magazine named Chanhassen as one of the best places in the nation to live for "small towns," defined as having a population between 8,500 and 50,000. And, in July, Family Circle named Edina the Best Minnesota Community for Families, too. Downtown St. Paul is bordered by the Mississippi River to the south, Marion Street to the west, University Avenue to the north, and Interstate 94 to the east. With the Capitol just a few blocks, downtown St. Paul is an ideal location for government workers. Additionally, many state offices are located in the area. Industrialized areas of Minneapolis and St. Paul are within short driving distance. Easy access to I-94 connects you quickly with the rest of the Twin Cities. It has been cold. It has even been snowy. And not only did we get a crummy summer, we've almost been gypped out of fall, too. 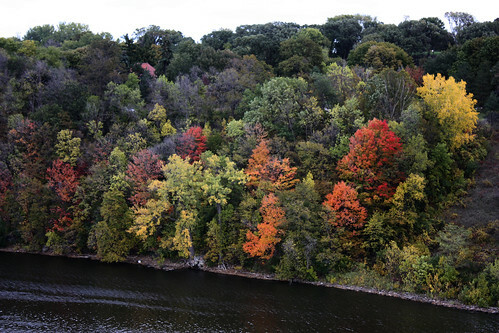 But there have still some great autum colors in the trees, even if they are a little harder to spot around the Twin Cities right now. 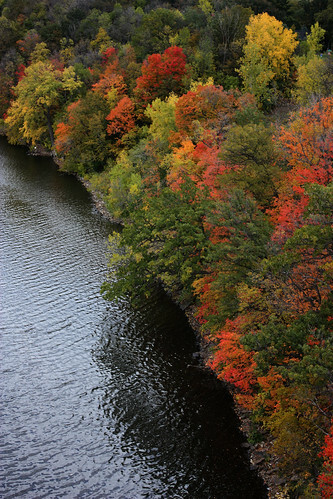 These pictures were taken along the Mississippi River in northern Minneapolis. Or was it St. Paul? Actually I was standing on the bridge in between, so... take your pick! There is still some time to see great color like this. 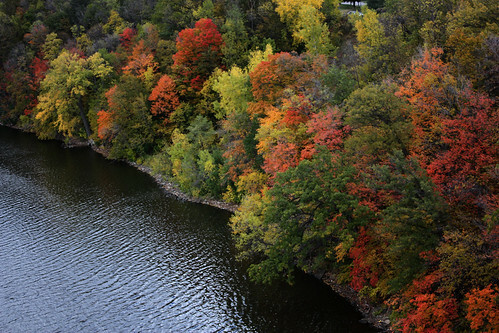 The Minnesota DNR Fall Color Report map can give you a pretty good idea of where you can expect to see some nice fall colors. The Pros Advantage is Taking Advantage of You! Warning: Stay away from The Pros Advantage! Today we received an inquiry through our website: www.homesofminnesota.com that was alarming. Someone thought we had stolen their website architecture...but the reality is they were swindled! What's even worse, the person who was swindled is a local agent in our company. Unbelievable. I feel bad for the agent who was ripped off because he had no way of knowing that the Pros Advantage is a bunch of deadbeats. Help us spread the word! Read more about what happened here. Be warned: "The Pros Advantage" is nothing more than a scam company that rips off designs and sells them as their own. The reason I give this as a warning is that when you buy one of these ripped off designs, you risk being sued by the copyright owner! Don't believe me? Click here to read more about what the Pros Advantage did wrong! Today I am even more confident in my decision to trust my website technology to the guru's at www.realestatewebmasters.com! Morgan Carey and his crew are honest, trustworthy, creative, and knowledgeable and they don't deserve to have their hard work blatantly copied and sold as cheap imitations! Keep up the good work Real Estate Webmasters! We are only 2-weeks into our 3 month test and the results are already getting pretty interesting. If you would like to review our Week 1 results, please Click Here. A HUGE thanks to Cal Carter for posting his comments and some of his own numbers last week! Below are Week 2 Raw Data and some thoughts from our perspective. Minnesota's students are near the best in the country when it comes to math, according to test results from the 2009 "Nation's Report Card," released by the U.S. Department of Education. Minnesota's fourth graders are in a statistical tie for first place with four other states, and the state's eighth graders are second only to Massachusetts. The math and reading tests are administered every two years. The reading results will be available in 2010. Last year, Minnesota's fourth- and eighth-grade students were found to be near the top of the world in math and science on the Trends in International Mathematics and Science Study (TIMSS). It showed that Minnesota's students were outperformed by only four of 36 countries in fourth-grade math, and five of 49 countries in eighth-grade math. Also, check out the No Child Left Behind scores! In the Twin cities metro area, St. Paul school district has also made headlines. Interim schools chief Suzanne Kelly, who became acting superintendent after Meria Carstarphen left the post in June, continues to push forward on student achievement, setting a goal of boosting test scores by an unprecedented 10% this year. "If St. Paul is to prosper, our future citizens and leaders must be able to read and write fluently, compute and think critically, create new artistic designs and sounds, and respect cultural and racial diversity," Kelly said at the annual "State of the District" luncheon Tuesday in downtown St. Paul.